Bangladesh has been wracked by a series of brutal attacks on secular writers and religious minorities. But only the death of a prominent Bangladeshi Islamist prompted the Islamic Circle of North America (ICNA) to issue a statement of condemnation. Wednesday's hanging execution of Islamist leader Maulana Motiur Rahman Nizami was "another shameful act of judicial killing which is part of the ongoing brutal persecution of political opponents by Sheikh Hasina's government," ICNA's statement said. 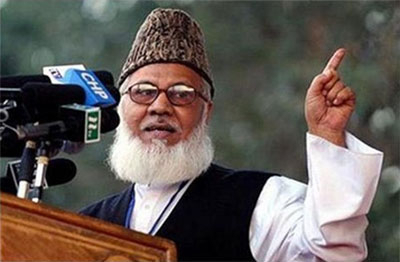 Nizami was a top leader of Bangladesh's Jamaat-e-Islami (JI) party and a former president of its student affiliate, Islami Jamiat-e-Talaba Pakistan. He was also a permanent member of the Muslim World League, a Saudi-funded organization created in 1962 for the global propagation of Wahhabi Islam. He was convicted for alleged crimes committed during Bangladesh's 1971 war for independence from Pakistan. A Bangladeshi war crimes tribunal determined that Nimazi led a secret killing squad called Al-Badar Bahini, which was created by the JI under orders from Pakistani intelligence to counter the Bangladesh independence movement. Three million people reportedly died in the catastrophic war and millions fled to neighboring India as refugees. But ICNA's strong condemnation of Nizami's execution and those of other JI-tied Bangladeshi Islamists in the past stands in sharp contrast to the Islamist group's notable silence following recent horrific terror attacks in Bangladesh that have included the hacking to death of a Bangladeshi academic, gay rights activist, Hindu tailor, and Sufi leader. Some of these attacks have been linked to the Islamic State and al-Qaida, raising the total number of terrorist slayings of secular blogger and critics of radical Islam in Bangladesh to 20 since 2013. ICNA is a U.S.-based Islamist organization that is inspired by the JI, a leading Islamic revivalist movement in South Asia. ICNA's curriculum promotes the teachings of Islamist scholar and JI founder Maulana Sayyid Abul Ala Maududi who preached that Muslims "must strive to change the wrong basis of government, and seize all powers to rule and make laws for those who do not fear God." Similarly, ICNA's charter calls for the "establishment of the Islamic system of life" in the world, "whether it pertains to beliefs, rituals and morals or to economic, social or political spheres." The JI also shares a strong partnership with the Ikhwan al-Muslimeen, Egypt's Muslim Brotherhood, a global Islamic revivalist movement founded in Egypt in 1928 that seeks to establish a global caliphate based on Islamic law. ICNA's statement fails to mention that the tribunal also convicted one of its senior officials. Ashrafuzzaman Khan, former vice president of ICNA, was convicted in 2013 on 11 charges related to the murder of 18 intellectuals during the country's 1971 war of independence. Khan and a co-defendant, Chowdury Mueen Uddin, who lives in the United Kingdom, were tried in absentia and sentenced to death. Evidence presented at his trial showed that Khan also was an Al-Badar leader. According to the tribunal's prosecution, "Al-Badar acted as 'killing squad,' in furtherance of plan of policy of Pakistan occupation army." The prosecution described Khan as "'chief executor' of Al-Badar to the accomplishment of the barbaric crimes, in furtherance of common plan and design, with intent to paralyze the Bengali nation." Khan allegedly was a central committee member of JI's student wing, the Islami Chatra Sangha. A hit list of targets of "intellectuals killing" was found in a diary recovered from Khan's home after he fled the country. A lone survivor from the 1971 Islamist massacre in Bangladesh tearfully told the tribunal that he personally saw Khan issue orders to squad members to kidnap, torture and murder intellectuals. "I witnessed the killings...from the beginning to the end. Ashraf [Khan] and Mueen [Uddin] led the killings." Surviving relatives of victims also recognized Khan, after his picture appeared in the Bangladeshi press, as the person who abducted their relatives at gunpoint. ICNA's swift condemnation of Nizami's execution also is posted on the Bangladesh JI website and echoes the strong condemnations by JI's regional branches in Bangladesh, Pakistan, and India. Nizami's execution was also denounced on the Muslim Brotherhood's English-language website, Ikhwanweb.com. The situation in Bangladesh is chaotic as is it in most of the Muslim world. These radical fanatical Islamists are causing mayhem where ever they go with their evangelical dreams of a global Islamic caliphate. Of course it has become entangled with heavy Machihavellian political maneuverings. The neo cons in Washington are partly to blame for all of this turmoil with their plans for the New American Century and the Wolfowitz plan for the Middle East and with the conniving assistance of the Saudis and Turkey funding and assisting the conflicts. Certainly the Saudi Wahhabi's money is being used in Bangladesh to fund these radicals.